It is important to keep in mind that no roulette casino game is aimed at making the player rich - it is only created to bring profit to the casino. Therefore it is important that players follow some simple tips while playing the roulette in order to reduce risks it is concerned with and to enjoy the game by occasionally winning their bets. First of all, do not try to bet on a single number as it is the riskiest bet in roulette, even though it's the most profitable one. It is better to make outside bets in the first place, such as bets on black or red, even or odd or on the whole column. This way you may get 1 to 1 or 2 to 1 payout, but at the same time your bet will cover more potential winning combinations. You may also put bets on two possible outside combinations. For example, you may bet on an even number and on low numbers group from 1 to 19. In such case you will also get more chances to win as the two bets secure each other and more numbers may be winning. Some players declare they may guess the winning numbers by analyzing the previous game results. For example, they state that if in a previous game a certain sequence of numbers was winning, like all blacks, one should try to bet on red. This may also heighten your chances to predict the winning numbers, but still it is concerned mainly with luck. 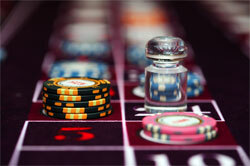 To get better chances of progress it is recommended to play European roulette rather than American. The house edge in American roulette is higher because of the second double zero it has. The house edge in European roulette makes only about 2.7% while in American roulette it is about 5.3%. Some casinos stick to "La Partage" and "En Prison" rules which offer an opportunity to secure the players' money. These rules correspond to outside bets and come into effect when zero comes out. The "La Partage" rule means that the player whose outcome is zero loses only half of the bet. "En Prison" rule offers a chance to save the player's betting money for another spin of the wheel. In case the player's bet wins this time, the casino returns the money to the player. If another combination comes out, the player loses. With another zero outcome, the player's bet will be postponed for yet another spin. Another opportunity to win is to watch the wheel closely for about a thousand spins of the wheel in search for any defects. Such defects may result, for instance, in producing more black numbers than red or even than odd etc. Attentive and patient players may stick to this tip and occasionally beat the house. The last but not the list recommendation is to stay concentrated and cool. The players shouldn't lose their heads as the copy-book maxim states: no casino aims at making the player rich; it is only created for its own profit. But if you follow our simple recommendations, you still may get a chance to fill your wallet with cash or simply enjoy the game itself.